When I was first married, I decorated our little rental home with Asian influences. I loved ginger jars, oriental paintings, and black lacquered furniture. 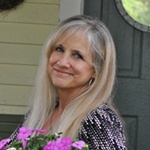 My sister on the other hand, was decorating in country style and the more she talked about it, the more I was drawn to it, too. Country style decorating has evolved over the years (just look at past covers of old Country Living magazines) and encompasses a wide range of influences … from primitive to shabby chic to modern. I tend to lean toward the farmhouse appeal of country decor; not too primitive and not too modern, farmhouse style fits somewhere in-between. Painted furniture in the form of a classic Windsor chair and and white dresser have country style written all over them. And then of course, there’s the “farm” pillow and the stone crocks to finish it all off. 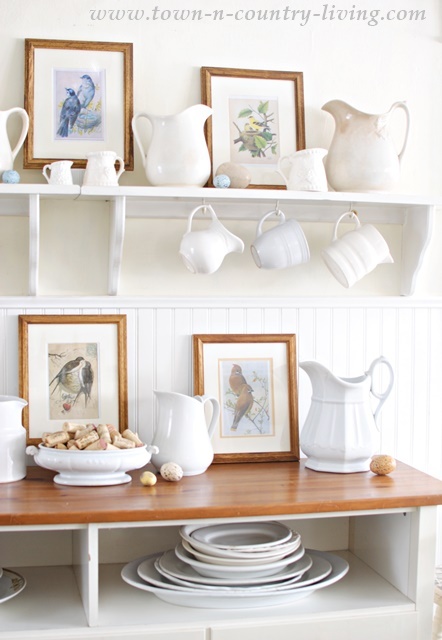 I love the clean, fresh look of white ironstone and also love hunting for pieces to collect! My favorite kitchen piece is my farmhouse sideboard. I purchased this from a friend at work. 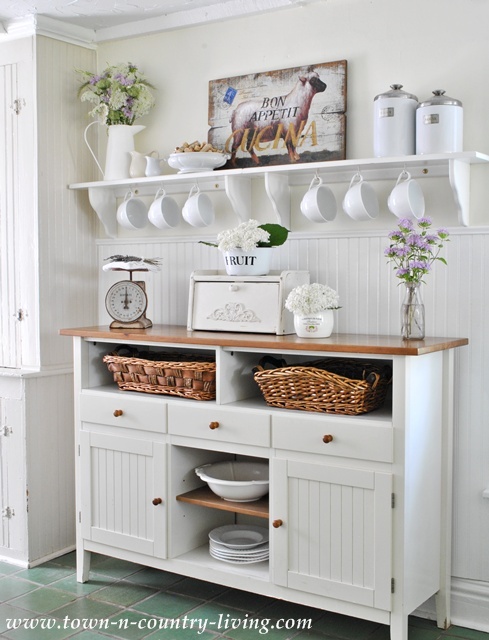 Freestanding furniture in the kitchen is a staple of country style decorating. I created a fun mix of bird prints with white ironstone two years ago during the spring season. Sometimes just rearranging what you already have is an easy way to create country style in your home. 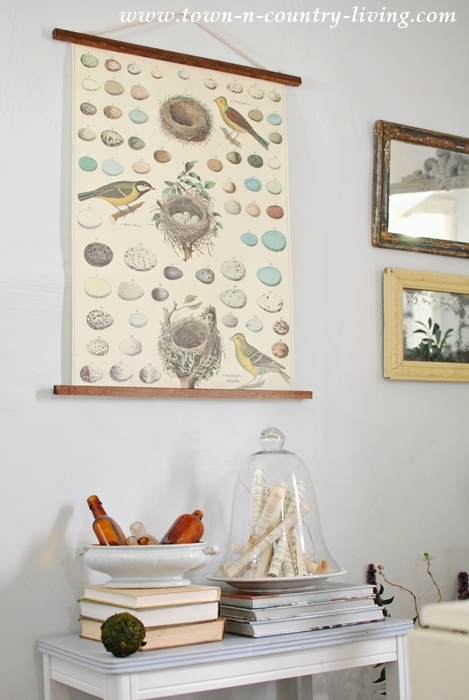 An easy and inexpensive way to add country charm to your home is to create hanging posters from vintage botanical prints. I love this country style home that I featured a couple of years ago. 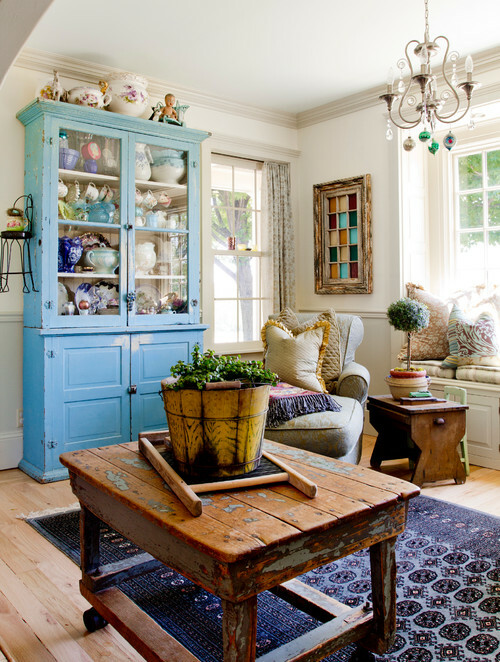 Blue is such a classic color when decorating with a country touch. 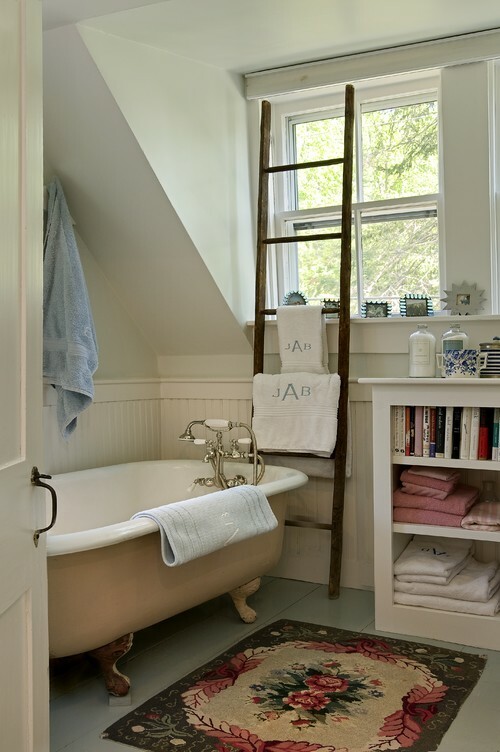 Is there anything more charming than a country bathroom? I featured several of them in my farmhouse style bathrooms post. 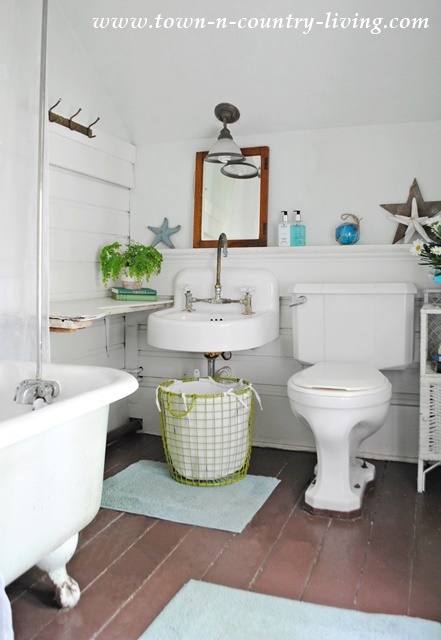 And then there’s one of my bathrooms with a painted claw foot tub. 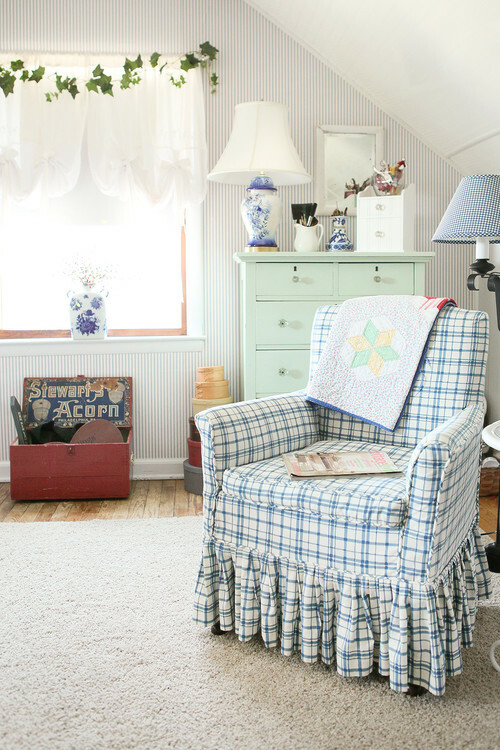 If you like a little color mixed in with your country furnishings, you’ll love this colorful home in Ohio. 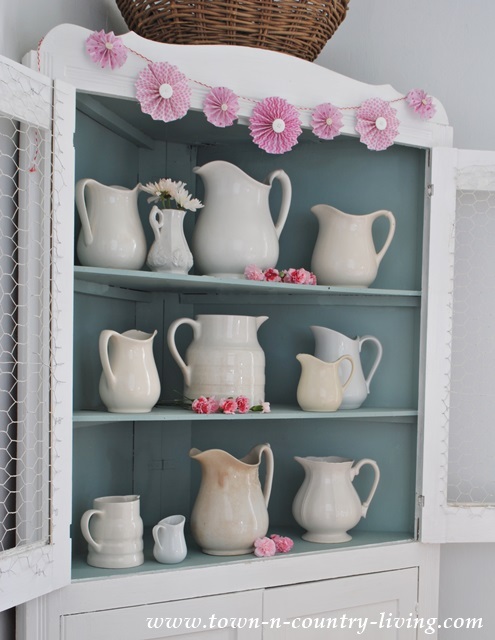 Earlier this week I featured country style kitchens if you’d like more country inspiration! 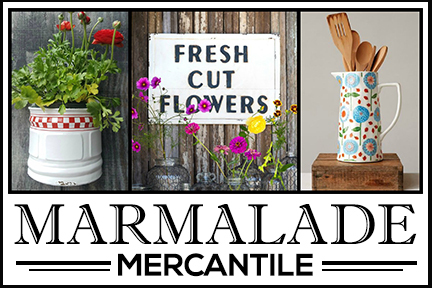 What are some of your favorite country style decorating pieces? The very first pine cupboard I ever bought, is still my favourite piece of furniture. I painted it white a few years ago. I call it my country home cupboard. 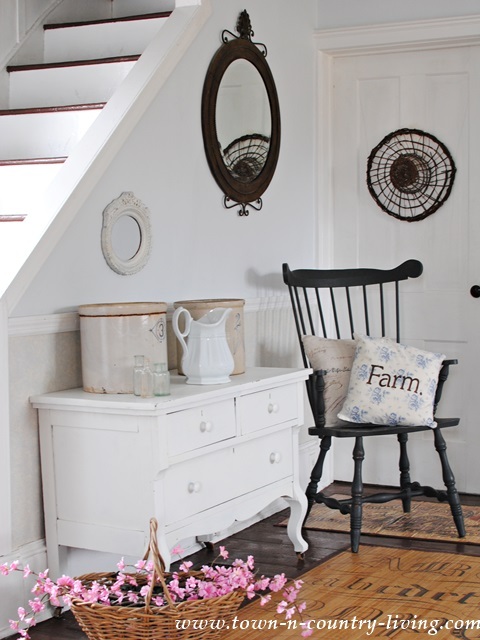 I would so much love to bring more of this farmhouse country style look in my home and I adore your blog for the wonderful photo’s and inspiration. Somehow though, I think I will never be able to have a home in this style. 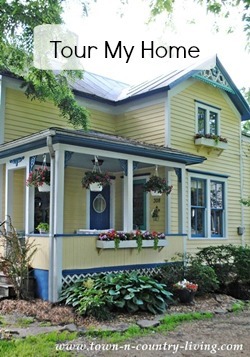 Our houses here are so different and also the decorations you show aren’t here to be found like those wonderful typical jars I see on so many blogs, I wouldn’t know where to look for them here. So, in fact I wish I lived in the US with its beautiful wooden houses, often with a porch and so very more farmhouse like than any house you find here. When we built our house, I wanted to build a wooden one, but my husband didn’t want to do so, he didn’t like the idea, it would be too expensive and noone has wooden house here, all the houses are brick houses. At least I love the bricks we used to build our house, still do after all these years. Inside I’d love to change it all though. I wanted wooden floors but there are tiles and not the pretty ones I had in mind if I had to go for tiles. I love those Portugese tiles but those were also far too expensive so we have an awful floor I have never liked. The furniture is wooden but I wish that would be painted. I did start on a few pieces but to do the whole lot all by myself is just too much work. And it’s not something my husband wants to do. 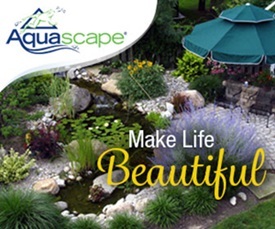 Also there is the garden I have to take on by myself as well since my husband isn’t interested in gardening, worse even, he really hates it. It’s all too much to accomplish if you’re all on your own to do it. It would be so much easier and I would be able to do much more if I had a bit more manpower around willing to help 😉 Meanwhile I keep dreaming and enjoying your home and blogposts. Thanks for that Jennifer! Farmhouse style feels so clean, calm, & welcoming! I love the blue bench. That shade of blue is just gorgeous! I used to collect Country Living magazines. Then I kind of got tired of them about five years ago. Just wasn’t the same. Country or farmhouse style is just easy on the eyes. I love to think about the people who previously used an item or made an item. If pieces in the home come from family members, even better. That seems so funny to think of your home decorated in Asian style. I bet it was beautiful, though. I would say I fall in the French country or shabby chic category, although I really like most decorating styles. I love all the things and rooms you show us, whether country or farmhouse it is all wonderful. Before i retired i found an old cupboard, it came in two pieces, and had those rounded tin drawers.